Showering before you go swimming is something that every swimmer is made aware of before going into commercial pools. The logic applies in the same way for residential pools as well, however most pool owners never actually do this. Why? Simply because it is not convenient and there is not a direct and immediate problem with the water if you decide to not bother with enforcing this rule. So do you really need to shower before going in your pool? Well, no, but if you want to make caring for your pool easier, then yes. Every time you go swimming you are introducing bacteria into the pool water. Many pool owners assume this is the reason why you should shower before going swimming however the main problem actually relates to detergents and phosphates as well as the oils on your skin. 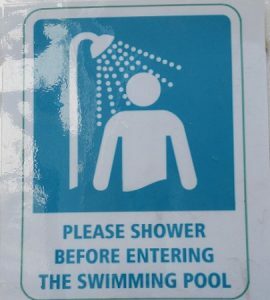 By showering directly before you go swimming you can reduce on the amount of contaminants that you introduce to the water. This has a trickle down effect in that you will put less stress on your filtration system, as well as require less chemical maintenance and corrections being needed. Phosphates – Phosphates are one of the more difficult and complicated problems that swimming pools need to deal with. Phosphates act as a food source for organic matter growth, and can readily use up free chlorine that is in the water as a result. Phosphates can be introduced to pool water in a number of different ways, but one of the most common is through laundry detergent that is on yourself and your bathing suits. Oils – Oils are a constant problem in swimming pools as they deplete the free chlorine available in the water as well as putting strain on the filtration system. Hair spray and gels, makeup, suntan lotion, moisturizer and even sweat are all oils that you could eliminate from your pool water by simply rinsing off in the shower before you go swimming. If you reduce on the amount of bacteria, phosphates and oils that get introduced to your pool then you will reduce on the amount of chlorine that your pool uses. In addition to this you will also reduce on the amount of chemical corrections that you need to make, as well as the amount of filter maintenance that you need to do. All of this adds up to less overall work for you, and cleaner water for you to swim in. After having your pool resurfaced with Marquis Quartz or Stonescape Mini Pebble by us at Advanced Pool & Spa, Inc. lots of people will be wanting to enjoy your “new” pool! The more people who use your pool, the more important it is to follow this basic rule. If your pool gets a lot of use then you should consider installing a basic outdoor shower near to the pool area to make it quick and easy to rinse yourself and your bathing suit off before taking a dip.